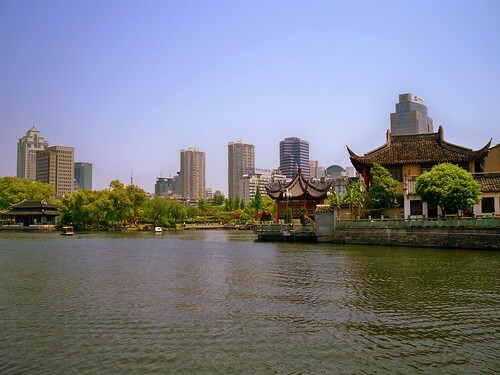 Located in Zhejiang province, Ningbo is one of China’s oldest cities, boasting inhabitants from as early as 4800 BC. Ninbo was one of the major port cities along the Silk Road, a 2,000 year old trade route that stretched from China to Persia. By the 10th century, Ningbo became a major world port used by Portuguese and Spanish traders. Today, the only city in China that surpasses Ningbo as a port is Shanghai. The city itself has a population of about 3.5 million people, with the surrounding area boasting over 8 million. It is one of the top ten tourist destinations in eastern China. While the city does not have what most cities of its size would consider a bustling night life, there are many restaurants, bars, and dance clubs clustered together in the local expat hangout area down by the river called Laowai Tan (literally, “foreigner beach”). A former DOS of one of our client schools has recently opened an expat bar and lounge called Karma + Stix. The Asian style lounge bar and pool hall is located in the heart of Laowai Tan on the 2nd and 3rd floors above The Office bar at 86 Zhong Ma Road. It is a great place to relax, have a drink, and meet people. Other recommended places are Constellation Bar, LBB, Pit Bar, and Easy’s. For those who prefer a more low key life, plenty of movie theaters, art exhibits, coffee houses, and museums. The city has always been highly accessible by bus and taxi, and in June 2014, the first subway line opened. There are plans to continuously expand the lines and create new ones. Being a coastal city, the district has over 500 islands. Most of these are not inhabited, nor are they worth visiting, but there are exceptions. Many people take weekend trips to Zhoushan, which is only accessible by ferry from Ningbo. Nansha beach is the hotspot, but in the surrounding areas, you will find plenty of seafood restaurants and other eateries. Putuoshan is another spot popular with tourists. Famous for its Buddhist temples, many people spend time in Putuoshan to experience a part of China no longer part of big city life. Monasteries and centers for Buddhist study still exist on this island. The grounds of Puji temple contain a small lake and traditional pagodas that are a great place to relax (see photo). Ningbo is a subtropical city, which means hot and humid summers. The winters are typically mild and while residents experience occasional snow, the temperature rarely falls below freezing. There are four distinct seasons, with the temperatures in July and August being by far the hottest, and December and January temperatures hovering just above freezing. Typhoons do pass by the area, but Ningbo is rarely affected as directly as its neighbors to the south. My husband and I had been researching for ESL teaching positions in Eastern China for 2 months before we came across Reach to Teach. What we found in Reach to Teach was professionalism and commitment to connect us with the best school that fit our needs in the region we desired to be in. We each had a very personable and organized interview over the phone. One week after our phone interviews, we began to receive job opportunities. We waited until the right opportunity with a very reputable school came our way. Reach to Teach recommended us and put us into contact directly with the school's director. Within one week after our introduction, my husband and I both had formal letters of acceptance and the school began to process our visa paperwork. We had spoken to various other independent schools and other teacher recruiting companies, though Reach to Teach was the only one to act quickly and very professionally. I knew I was in good hands and have no doubt the school we chose is a great fit and will be a very rewarding experience. If you are thinking of teaching English abroad, I highly recommend Reach to Teach for your placement opportunities. Experience China While Teaching in Ningbo! Like most cities in China, Ningbo contains several popular historic sites. The Tianyi Pavilion Museum, sitting near Moon Lake, was built in 1516. The library, one of China’s oldest, still contains 11th century wood carved books and Confucian classics. While there, don’t forget to stop by Moon Lake park-a great place to have a picnic, explore pagodas, and even rent a paddleboat. If you prefer a more rustic experience, Zhaobao mountain is the perfect place to spend on your days off. There are seemingly endless trails that open into temples and pagodas. Hikers can find Buddhist texts carved into the sides of hills in Sanskrit. Also near the mountain is the Weiyuan City Wall, a 2,000 foot long barrier to keep out intruders. The largest lake in Zhejiang province is Dongqian lake. This lake will be a welcome relief for those looking for a more natural water experience compared to the cement laced lakes closer to the city. The lake is surrounded on one side by forest and the other by mountains. Climbing some of the hills allow views of the entire surrounding area, including the lake itself and the city. Teach English in Ningbo– Get ESL Job Advice from the Experts!